Ah, Prada and their infusions. Simple, light and usually easy to wear. Infusion d’Iris is still one of my favorite scents. And I absolutely love rose–if done right. So I gave her a try. In Bottle: Big old Bulgarian rose right in my face with a splash of refreshing mint. Applied: This smells like Bulgarian rose with a little squirt of mandarin. I don’t really detect much else aside from that until the mint comes up in the initial stages and gives Infusion de Rose this sort of crisp, watery quality to it. The fragrance keeps aging with the rose taking a dominant role and continuing to play a dominant role until the endstage. I get no wax or holly and have no idea how to detect the smell of beeswax anyway. All I know is, this is a very simple, very crisp and refreshing rose fragrance. Far from interesting or unique but still does a good job. 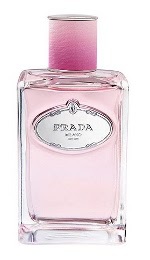 Extra: Infusion de Rose is a member of the Prada’s infusion series. There’s an entire series of this stuff where Prada takes a fragrance concept and runs with it. They’ve done Iris, Tuberose, Vetiver, and more. Design: Infusion de Rose is designed in the same way as the other Infusion fragrances except it’s main color is a very girly pink. If lined up in a row, these bottles look absolutely beautiful. I’d love to collect them just to put them on display. The glass is clear, the bottles have a nice weight to them. The design is classic and simple but still very functional. Notes: Mandarin, beeswax, holly, rose, mint. I would buy this only so I can say I’ve got it for my collection. But as a fragrance, Infusion de Rose isn’t very interesting or new. You could get dewy modern rose in almost any modern rose-based fragrance. It’s just not unique but it does follow the style of Prada’s infusion series rather well. Reviewed in This Post: Infusion de Rose, 2011, Eau de Toilette. This entry was posted in floral, prada, Reviews By House and tagged beeswax, holly, mandarin, mint, rose. Bookmark the permalink.